Who doesn’t love the Wingstop’s lemon pepper wings? Lemon pepper chicken wings are flavorful, but not spicy like buffalo wings, so everyone can enjoy these easy to make wings. Wings are a wonderful addition to a party, game day, or even for dinner. I know that I personally love wings in all varieties, my two favorites are garlic buffalo wings, and of course Parmesan garlic wings. 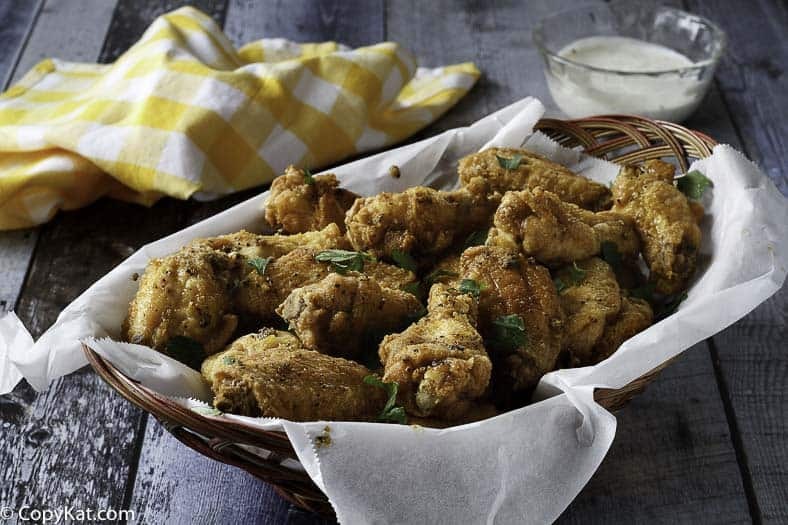 This lemon pepper wings recipe will soon become part of your rotion of fun to make snacks. I use a technique that is slightly different than the restaurant, but I feel this method is better for the home cook. Some people may think it is difficult to fry chicken or perhaps you want chicken wings that are slightly healthier. I like to two a two process method where we start the wings in oil, then transfer them to the oven. This has a couple of advantages, you can keep your wings warm until they are ready to be served, and you will know your chicken if fully cooked. I hope you enjoy these lemon pepper wings for your next game night, Super Bowl, or they are even great for dinner. 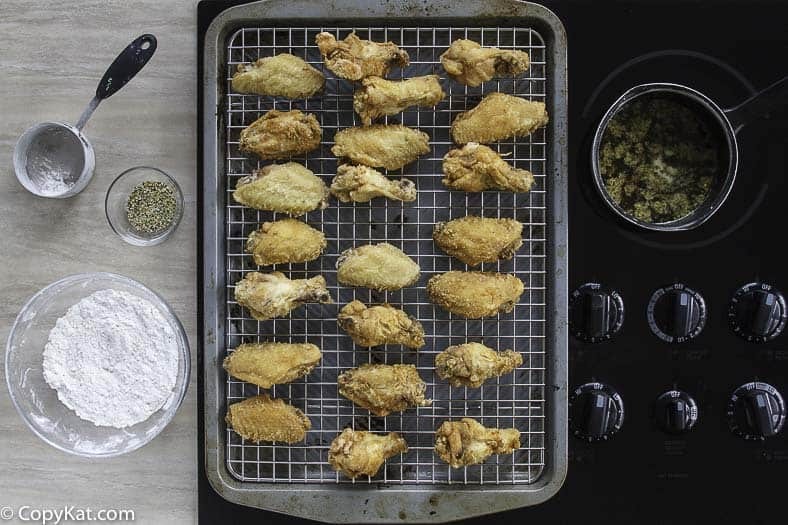 Enjoy the famous Wingstop Lemon Pepper Recipe at home when you prepare this copycat recipe. Preheat oven to 350 degrees. 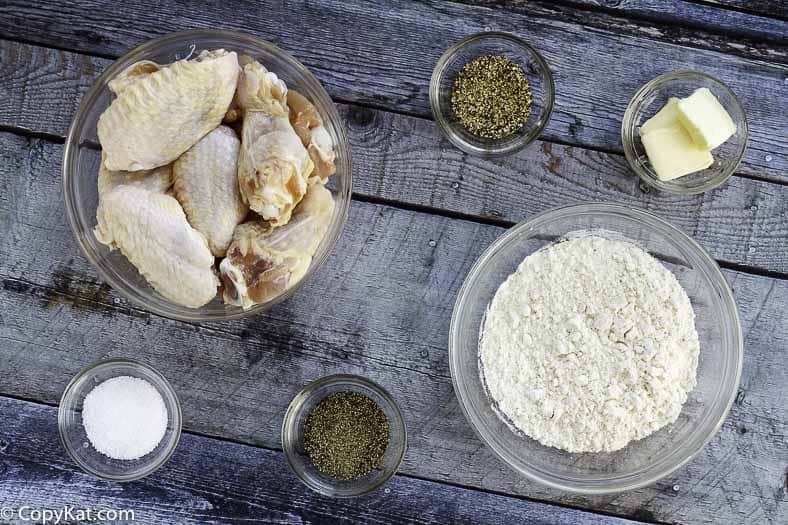 Prepare seasoned flour by adding 1 cup of flour and the salt and pepper to a medium sized bowl. Stir until well blended. Cut wings for recipe. Cut wings on each join, there are two joints per wing. You can save the flapper(tip) portion for stock, or you may wish to discard this portion.Dredge the wing portions in seasoned flour. Shake off excess. Heat vegetable oil to 350 degrees. You can use any vegetable oil. Add enough oil to cover the bottom 4 inches of a medium sized saucepan. Cook wings for 5 to 7 minutes or until they start to turn golden brown.Place wings on a rack on a cookie sheet and bake for 10 to 15 minutes. When chicken is golden brown combine with melted butter and lemon pepper. How do you guys make cajun wings? I cant replicate that taste for the life of me. I don’t know, I’ll have to try them. 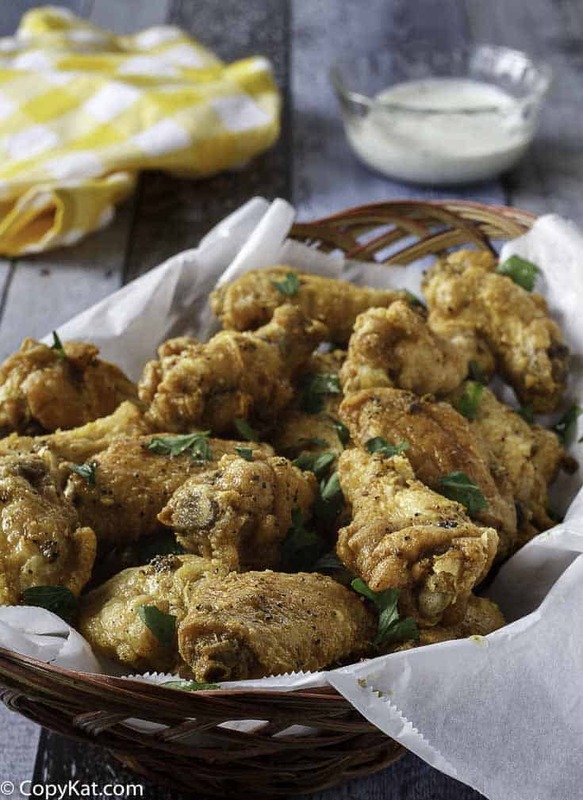 These lemon pepper wings are awesome, and this recipe has become a part of our meal planning. Wow, I am really honored I made your worst ever website. This is an awesome site and recipe, thank you so much. We fry naked wings at 350 degrees for 11-18 minutes, depending on size and crispiness. We have a soybean oil product called Wing Gold that we mix 2 cups of seasoning on per gallon to make the light sprinkle on the top stick, although the taste can easily be improved with butter or margarine. Toss your butter mixture very lightly in a bowl and add seasoning to taste. All of our food is impossibly simple, with lots of sugar and salt. If you want fries to tow it’s sugar, salt, pepper, and garlic. We get it in bags so I’m not sure about ratios but if it’s that deep you can just ask us for a side. Worst they’ll do is charge you a few cents for it. Same goes for the lemon pepper. Hope this helps, good luck on the wings. ???? Thank you so much, you are awesome sauce.???????????????????????????????? Wtf you talking about dave bet i make better wings than you and im white. I work in the culinary feild and believe me race has lil to do with the ability to cook good food. I make better wings than u & I’m also in the culinary field and I’m not white ??????? ?